I assume the instruction to "let the biscuits sit in pan for about 15 minutes before baking" is deleted?? Thanks for all your wonderful recipes. Yes, that was deleted in this version. I added an extra egg, a bit more baking soda as well as slightly decreased the buttermilk (to compensate for the additional egg). I think the extra egg helps bind these a little better for slicing and using as sandwiches while still keeping the biscuit texture. I didn't want to make sandwich buns out of them but just a bit sturdier biscuit. These were perfect! 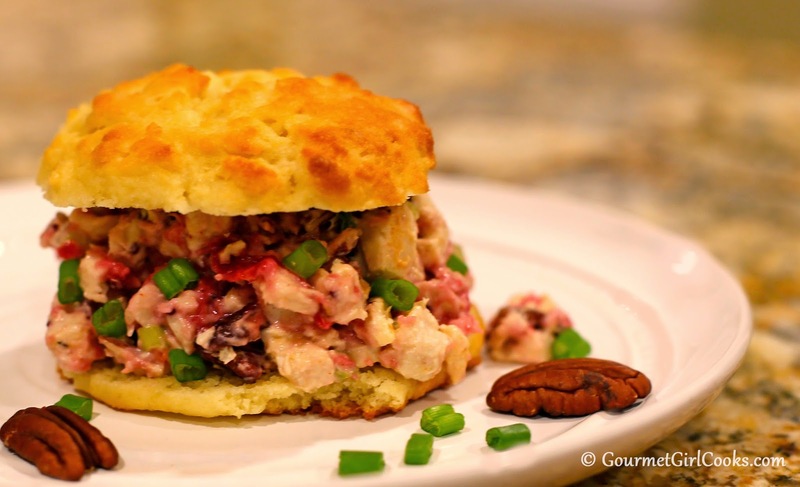 The family declared that these were the best LC biscuits we've tried yet, and we've tried a lot. They remained tall after baking (while others tend to go flat), held up to slicing in half and had great texture and flavor. Used them for bacon-egg-cheese sandwiches this morning too. Definitely a keeper! 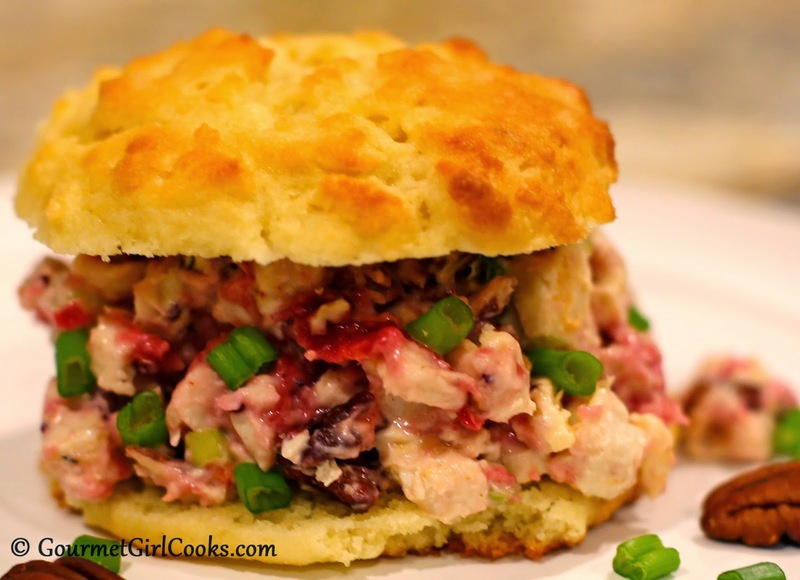 Made the chicken salad last night and love the cranberry in it. Love your blog--everything we've made has been wonderful! I'm so happy they worked out so well for you and am honored your family declared them the best LC biscuits! Ooooh, freezing is a good idea! I will try that on my next trip. So I have made this version several times, and it does hold up as well as slice more easily, although slicing isn't always necessary - we just put butter on top! My husband says this biscuit is easier to eat. I found in my oven it was a little more tender baked a few minutes less, 18 instead of 22. However, I confess I like the taste of the previous recipe, I believe it's #2, better. It has a stronger buttermilk flavor, which I enjoy so much. But it is crumbly. Sigh. What to do? Guess I will just have to alternate, depending on what use I have planned for the leftovers. It's a dilemma I am very happy to have! Thanks for all your creativity and hard work, and I hope you are feeling better these days. Thanks so much...I'm much better and almost completely well. I agree with you about liking the taste of the version #2 a little better but these do hold up a little better, especially when using for sandwiches, etc. Loved this version the best! I was out of buttermilk and tried using yogurt, these too turned out great! Thanks so much, your recipes are awesome and such a help to this lifestyle. So happy you liked these! Yogurt is a great sub for buttermilk. You also can use regular milk, half and half or cream by placing 1-1/2 teaspoons white vinegar or lemon juice in a glass measuring cup and then filling to the 1/2 cup line and allowing it to sit for 5 to 10 minutes. Has anybody tried adding a scoop of unflavored whey protein powder to Biscuit #2 to combat the crumblies? I made Biscuit #2 with one scoop of unflavored whey protein powder and it helped! I was able to slice them lengthwise without them falling apart. I don't know if they would hold up to sandwiches, but they were much more sturdy. Holy Moley, these were some good biscuits ! My husband has been picky about LC stuff, especially bread, rolls, pizza crust. He liked these as soon as they hit his mouth !! So delicious ! Can't wait to try these for an egg muffin for breakfast. Thanks for a great recipe !! I thought the days of eating anything this good was behind me. Oh My these are wonderful! Ate 2 warm with butter last night. Today it was breakfast sandwiches with egg and ham! When we travel I always take a few of the 'hamburger buns.' Now there will be a baggie with these as well. Thank you for all these recipes. It has made my GF days so much more interesting! I did freeze 6 of these but they won't last long.